Bored secret agent David Somers (Trevor Howard) takes a job cataloging the butterflies in the collection of Nicholas Fenton (Barry Jones). 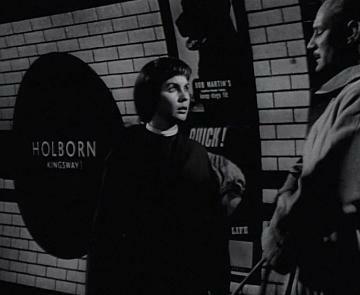 When Fenton's niece Sophie Malraux (Jean Simmons) is suspected of murder, Somers - convinced of her innocence - flees with her to London. 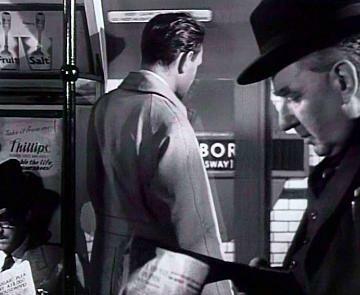 While there, after a brief separation, they meet on the "King's Cross platform" at Holborn. 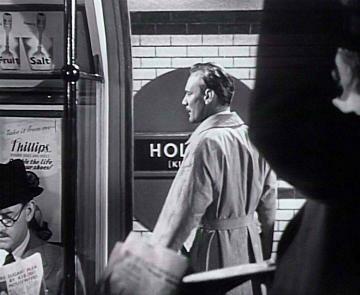 This short scene sees Howard arriving on a train ,and then talking to Simmons on the platform, and it certainly appears to be a a real station, but the tiling design of two parallel horizontal bands with plain white above and below does not match either the Piccadilly1 or Central2 line platforms at Holborn. The London Underground roundels feature the correct station name of "Holborn (Kingsway)" still in use at the time, and while they are of the "solid" type not used since the turn of the century, similar ones were certainly in place on the Aldwych branch platform around ten years earlier, although placed higher up the wall.3 The roundel the train stops next to is actually the same one Simmons is then seen standing next to, even though she was not visible in the earlier shot. If a real station was actually used, it is effectively unidentifiable. 1 Rose, Douglas. Tiles of the Unexpected. London: Douglas Rose, 2007 (page 96). 2 Bruce, J. Graeme & Desmond F. Croome. The Twopenny Tube. Harrow: Capital Transport, 1996 (page 35). 3 Horne, Mike. 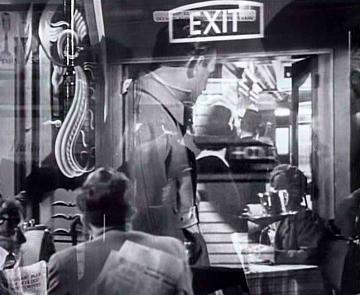 The Piccadilly Tube. Harrow: Capital Transport, 2007 (page 102).